On my way to office, which is located in Bagmane Tech Park, C.V. Raman Nagar, our office cab passed through the streets of Austin Town. On the pedestrian footpath, lay a helpless, old soul, wrapped in torn bits of clothes and plastic. On inquiry, her neighbors revealed that she has been lying in the same place for more than 10 years, all by herself. On December 19th 2012, after office hours, I decided to spend my evening with the elderly citizen. I held her tiny old hand to hear about her life and share her heart. She spoke to me in Tamil, in a feeble and soft voice. Her name was Naigamma and her husband’s, Joseph. They had two daughters, Anna Mary and Lourde Mary. Her two children were no more, having suffered an early death. After her husband’s demise, she was forced to vacate her small rented home, as she was left with nothing to sustain her livelihood. A beautiful rosary adorned her neck, with which she prayed ceaselessly each day, before St. Mary’s Chapel, on the opposite side of the road where she lay. She was over 85 years of age and was slowly losing her vision and hearing as well. I was determined to help my old friend and started inquiring about vacancies at old age homes in and around Bangalore. Asha Bhavan, a home for destitute woman, run by sisters, was ready to provide her shelter. Finally at early dawn on December 20th, Nagamma was given a good bath and clean clothes. As she sat comfortably in the auto, she leaned on me for support and my heart was so desperate to give her all the love she needed. It was truly the most memorable of journeys! As we made our way to Asha Bhavan, located on Sarjapur Road, she sipped on a fresh citrus juice. And through the journey, as the auto passed through unseen roads and huge city towers, she bubbled with joy and seemed to thoroughly enjoy the ride. The sisters in Asha Bhavan declared her as their “Christmas Gift”, and the blessed child of God was greeted with love into her destined home. She was surrounded by many old friends who were once destitute, but are now part of a lovely family. The sisters provided her with a wheel chair and led her to the dining table where she was fed good food. Once the registration was done, she was allocated her own bed, clothes and a cupboard. With frequent medical check-ups, counselling, rehabilitation programs, a healthy diet, access to recreational facilities, a hygienic and peaceful environment, and above all, ample amounts of love and care, Naigamma is a very happy woman today. As her guardian, friend and granddaughter, I pay her visits and spend time with her, listening to her many untold stories. As a responsible citizen, I have felt the need to fulfill my duty in helping our elderly citizens. The Ministry of Social Justice and Empowerment, Government of India has provided many facilities for the benefit of senior citizens. It has announced the National Policy on Older Persons covering all concerns pertaining to their welfare and thus improving their quality of life. Many Schemes like Antyodaya and Annapoorna have been formulated to aid elderly citizens who fall under the Below Poverty Line (BPL) category. Under the Old Age Pension Scheme, monthly pension is given at variable rates to the destitute old, by various State Governments/UT Administrations. Though the government provides ample assistance to the elderly citizens of the country, to help sustain a life of respect and honor, many of them are unaware of them. As responsible citizens, it is our duty to educate them of their rights and privileges. Towards this cause, let us join hands in making a difference in someone’s life today. Editor’s note: This article has been modified from its original version. The text has been edited for publishing in Citizen Matters. 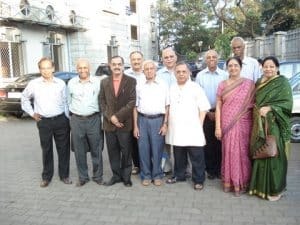 The Non Resident Indians Parents Association (NRIPA) in Bangalore serves as an extended family to its members. This is their story.